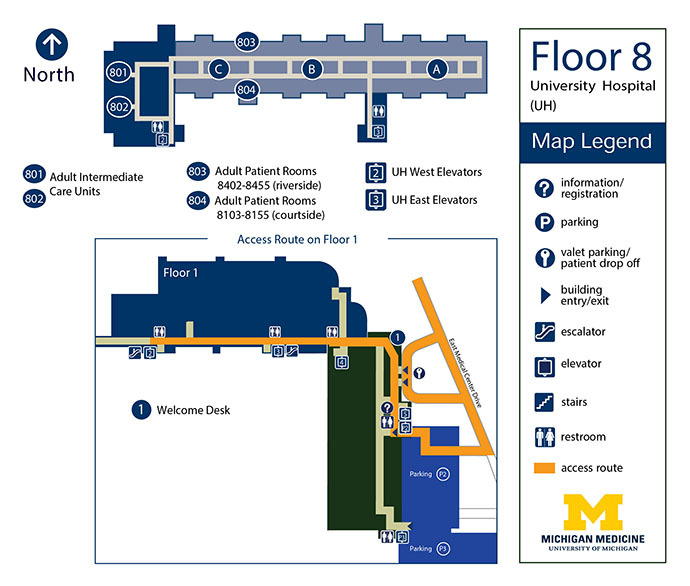 *Detailed directions to services located on Floor 8 of the University Hospital are listed below. Look for signage to assist you in finding your location. Continue down the hallway until you reach the East Elevators. Take the elevator to Floor 8. When you exit the elevator lobby, follow the hall until you reach the patient halls. Signage will indicate the room location. Continue down the hallway until you reach the West Elevators. Take the elevator to Floor 8. When you exit the elevator lobby, take the first left & follow the corridor to the unit entrance.